Curbside composting is a way to recycle food scraps and compostable materials through a pickup service rather than at home. 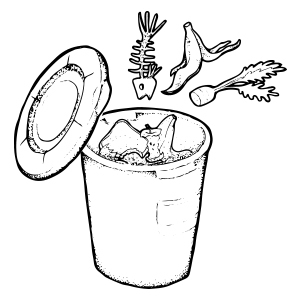 Instead of throwing food scraps, bones and meats, seashells, paper products, and other compostable material into the trash, households use a Garbage to Garden bucket with sealed lid. Each week, subscribers put the bucket on the curb for Garbage to Garden to service. Garbage to Garden brings the food scraps to local farms to be composted. * Participants may receive as much as 1 bag of finished compost a week, upon request. The compost returned to participating households is Benson Farm Surf n Turf compost and is approved by MOFGA for organic gardening and crop production. *For us, community composting is all about composting locally. That means, whether you are in Maine or Massachusetts, your food scraps are being composted close to home either at Benson Farm in Gorham, ME or Rocky Hill Farm in Saugus, MA. What are the benefits of composting through Garbage to Garden? There are so many benefits! Our participants are routinely surprised by how much their new compost bucket positively impacts their household. You get much more than food waste pickup! Sign up now! Sign up online right here on our home page! Or, give us a call during office hours, 9am-3pm Monday-Friday at the numbers below. You can obtain your first bucket at any bucket pickup location or request it be delivered. Where should I keep my bucket? With our smaller 5-gallon buckets, most participants keep them in the kitchen, either under a sink, in a cabinet, or a pantry. Alternatively, participants who choose our 12 gallon bucket often collect their scraps in a a smaller counter-top container and keep their larger bucket in their garage, closet, or porch. What can I put in my bucket? In soil terms, the word "organic" is used differently than it is when classifying produce at the supermarket. When we say we can accept anything "organic," we mean anything that was once alive. In a similar vein, any compost that is marked as "organic" simply means it is made from materials that were once alive and have decomposed. The finished compost that Garbage to Garden delivers back to you is Benson Farm Surf n Turf compost, approved by MOFGA for organic gardening and crop production - so food grown using the compost may be "organic" in the supermarket sense, too! When is my service day? What time will my bucket be serviced? Maine: We begin each route at 6:30am. Your bucket should always be out by this time to ensure service on your garbage day. Massachusetts: We begin each route at 6:00am. Your bucket should always be out by this time to ensure service on your garbage day. Our routes vary due to weather conditions, route changes, or local events. The time we exchange your bucket may vary as well. If you feel your bucket may have been missed, please feel free to contact the office. Will I receive a clean bucket or a fresh compostable liner with my service? Massachusetts - Each week on your designated service day we will empty your bucket and re-line your bin with a fresh compostable liner. Maine - Each week on your designated service day we will swap your bucket for a clean bucket. Do you service on holidays? What about during heavy storms? As a general rule, we follow your city’s trash & recycling collection schedules when it comes to holidays or inclement weather cancellation. With few exceptions for large storms, our office is open M-F from 8:30am-4:00pm and closed only on Thanksgiving Day, Christmas Day, and New Years Day. In the event of a holiday or inclement weather cancellation, we will post the service announcement on the front page of the website, and to our social media pages (Facebook and Twitter) along with a direct email to the affected service locations. Can I get extra buckets for a party or event? We've got you covered! If you need a few extra buckets for a one-time event at your normal service location, we can drop them off the week before and you can return them the following service day for a one-time charge of $5. Keep in mind that we may need up to 3 days advance notice in order to fulfill your request. If you need a last-minute extra bucket for a house party and do not want it to be replaced at the curb, you can purchase a bucket at a bucket pickup location for $5 and put the bucket out on your garbage day. 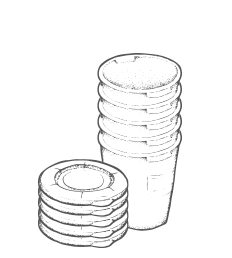 If you would like it to replaced (so that you have extra buckets on hand), give us a call or email and we'll instruct the drivers to pack an extra replacement bucket for you. For larger events with substantial food waste, visit our Event Quote request system and we'll help make your event as zero-waste as possible. What should I do with used cooking oils? Garbage to Garden participants interested in contributing used cooking oils to biofuel production should do the following: fill any plastic, recyclable container with a screw-top lid (or very tight- fitting lid, like a deli container) with used cooking oil and place it on your curb next to your bucket (in a place it will not spill over) on garbage day. We bring the cooking oil to Maine Standard Biofuels where it will be refined into biodiesel and Bioheat Home Heating Oil. Also created during the process of refining the waste fats and oils is Wicked Strong Soap, a powerful de-greaser that we use to wash our buckets. If you are interested in further reducing your home's carbon footprint, check this out! Garbage to Garden participants receive a 5 cent per gallon discount to heat your home on Bioheat. Contact Maine Standard Biofuel for details. Fun fact: on average the Greater Portland area uses over a million gallons of cooking oil a year. Pouring cooking oil down the drain is harmful to your home's pipes as well as plants and wildlife. That's why we help you to recycle it into renewable energy. Renewable energy is better for the environment since it is less energy intensive, creates fewer emissions than fossil fuels, and helps decrease our oil dependency. The Maine Standard Biofuels plant has the capacity to produce up to a million gallons of biodiesel a year, so together we can make a huge difference. Let's make it happen! " Do you compost for businesses? Absolutely! From weekly curbside pickups to complete waste management solutions (and everything in between) we tailor our services to meet your unique business composting needs. We are serious about waste reduction, and we work with you to establish a sustainable, thoughtful composting strategy. Visit our business page to obtain more information. 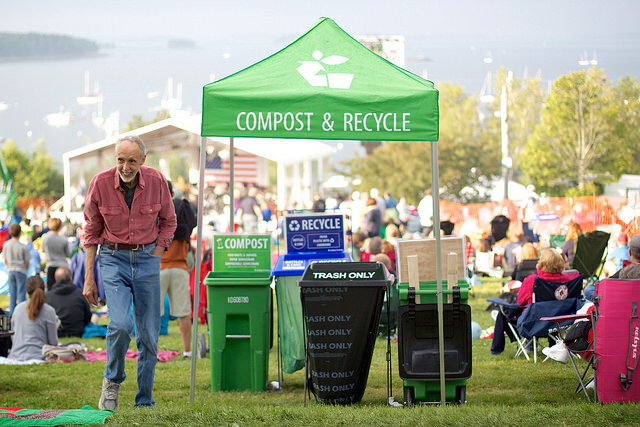 Do you compost for events? We offer compost collection for events as well as complete "zero-waste" event waste management services to give your big day the green radiance it deserves. From weddings to backyard BBQs to large-scale festivals, Garbage to Garden works with events of all sizes. Visit our event page or email events@garbagetogarden.org to learn more. For us, community composting is all about composting locally. That means, whether you are in Maine or Massachusetts, your food scraps are being composted close to home either at Benson Farm in Gorham, ME or Rocky Hill Farm in Saugus, MA. The composting process our partner farms use is thermophilic - which means our piles sit at temperatures of between 140 and 160 degrees. When piles of compost rest at high temperatures like this for more than five days, they're able to kill most pathogens (things like viruses and fungus that cause diseases). What this means is that our composting process is able to break organics down quickly and kill the bad stuff, leaving us the good stuff to use! All of the finished compost returned to Garbage to Garden participants is Benson Farm Surf n Turf compost, which made up of oceanic residuals (things like lobster shells), cow manure & food scraps, and is approved by MOFGA for organic gardening and crop production. Contact Benson Farm for more information. How do I request compost (Benson Farm Surf n Turf)? Login to My Account using your email address. Under the "Service" section, you can view your upcoming compost drop-off requests and request additional weeks of bagged Benson Fam Surf n Turf compost. At this time, you are allowed to request ahead 12 weeks of compost drop-offs. For bulk Benson Fam Surf n Turf compost orders, please contact our office. How much compost can I get per week? Standard residential accounts can request a bag of compost with service every week. We bag Benson Farm Surf n Turf compost at our shop, and each bag comes out around 2.5 gallons. Can I order additional compost? 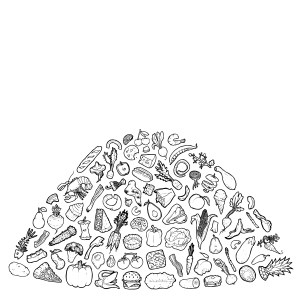 You can order additional compost (Benson Farm Surf n Turf) online through the My Account section. If you would like a few extra bags, you can purchase additional bags or contact our office about bulk pickup or delivery. Bulk pickup is the most economical option. We can fill any sized container you provide; typically, people bring 10-20 gallon plastic totes, trash cans, or truck beds with tarps. Can I purchase a large delivery of compost? Yes! We can deliver up to 3 yards of compost (Benson Farm Surf n Turf) per truck at one time and can arrange larger deliveries through Benson Farm. Delivery dates are limited to truck availability and may only be available on certain days of the week; please place your order two weeks in advance of your desired delivery date. What do I do with the empty compost bag? We would love to reuse it! 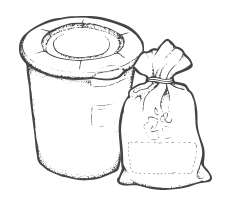 After using your compost you can take the white compost bag and place it under your Garbage to Garden bucket on your service day. We'll pick it up when we replace your bucket. Placing it under your full bucket helps to keep it from blowing away. I've heard that compost can burn my plants. Do I need to mix Benson Farm Surf n Turf compost with soil or dirt? If you are applying the compost to the top layer of a garden, no. The compost we give back to participating households, Benson Farm Surf n Turf compost, is garden, plant and vegetable ready! Benson Farm recommends adding a 1/2" layer to the top of the soil, leaving space around plant stems and tree trunks. Then, let the worms do the rest! For new garden beds, mix 1 part compost (Benson Farm Surf n Turf) to 2-3 parts topsoil. For further questions on compost use, visit a local garden center or contact Benson Farm directly. I want to know more about composting. What is your recommended reading list? Garbage to Garden is fully funded by the participants in the program. We have a minimum monthly fee as well as "trade" options to waive payment. For trade options, please refer to our volunteer program and referral program. The minimum monthly fee is $15/month or $165/year ($13.75/month) for an annual payment. The fee covers the cost of weekly collection, weekly bucket cleaning, and delivery of free bagged compost. The fee also supports Garbage to Garden's school programming and compost donations to schools and community gardens. The compost bucket is $5 and can either be obtained at a bucket pickup location or through the signup process. Online, we can accept Visa, Mastercard, and Discover. We can also accept checks and bill pay from banks by mail, and cash in-store. In the "Billing" section of My Account you can update your billing address, add and remove automatic credit card payment methods, pay your service bill, or even pre-pay for service. You can also contact or visit the office during normal business hours and we would be happy to help you. Can I pre-pay for service? Definitely! We have many participants that opt for an annual subscription. 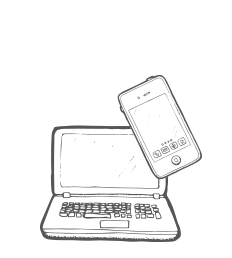 In the online signup process, you can select monthly or annual billing (please note, it auto-sets to renew), or you can send a check for a pre-paid term. At this time, the incentive for pre-paying for your account is a one month discount per year of payment (pay for 11 months, get the 12th free!). The cost of $154/annually works out to $12.83/month. If you are paying by cash or check, you are welcome to pre-pay any amount in person at our office, or by mailing a check to us. If you have any questions please contact our office. How do I suspend my service if I'll be away? If you are going to miss a single service day, it is helpful to know and you can email or call the office. Don't worry if you don't mention it to us. We'll service your bucket as normal when you return. If you are going to be away on a vacation for more than one week, you can suspend your service either online or by contacting our office directly. Suspensions longer than 1 month are eligible to be suspended from auto-billing by contacting the office.  To access your account suspensions, login to My Account and fill our the Suspend Service form under the "Service" section. If you travel or move between addresses seasonally, please contact our office directly. If you will be missing service for more than 3 months at a time, we will actually deactivate your account during that time to ensure that there are no issues with your pickup address and that you are not billed during that period. You may re-start your account at any time with no penalties by contacting our office. For Maine residents - Beginning January 1, 2019 there will be an annual container maintenance fee of $6.25 charged to every account on January 1st of each year. For participants with automatic payments set up, this will be automatically charged to the card we have on file. For all other participants, there will be a balance posted to your account. Can I join the volunteer newsletter? Yes! Our volunteers help drive our community operations and we always welcome any help you can provide. Visit the volunteer page to subscribe to our volunteer newsletter. You'll receive monthly information about our shop operations that may need assistance along with an overview of upcoming events where we could use an extra hand. Volunteers who are already Garbage to Garden participants will be eligible to receive a free month of service. How does volunteer credit work? Any time a Garbage to Garden participant volunteers at one of our eligible events listed in our monthly volunteer email, or around our shop - the participant is eligible to receive a free month of service. The free month credit is applied to the following month of service. There is no limit to the number of times one can volunteer - in fact, some of our participants earn completely free service by volunteering just a few hours each month. In some cases, multiple free months may be earned at one time.  What does volunteering usually involve? At our shop: We have projects for volunteers year round, and can work with you to find a time that works with your schedule. Some examples of volunteer projects include; labeling buckets, organizing event equipment, and tying and stacking bags of compost (Benson Farm Surf n Turf). Volunteer with us at our shop for 1-2 hours to earn a free month of curbside composting service! Community Events: We partner with numerous events that want to be zero-waste and compost, or that want to showcase curbside composting. Volunteers help us manage sorting stations and/or staff the Garbage to Garden information table & help us spread the word about our service! Local Organizations: We partner with various local non-profit organizations to boost their volunteer participation for a certain month or event by offering a free month of service to those who attend. We do this to expand our impact in the community and offer a feel-good way for participants to keep costs low. To see this month's activities, join our volunteer newsletter at the volunteer page Typically, the organization has a related mission, although we are open to new partnerships. Contact our volunteer coordinator at volunteer@garbagetogarden.org with upcoming events, organizations, or causes in need of help. 1. Login to the new "My Account" section of our website. If you have not yet setup your account, you must first confirm your email address. 2. Find your unique 6-digit referral link under the "Get Involved" tab. 3. Share this link with your friends and family, on social media and anywhere else you want! Anyone who signs up under your code will automatically credit you 1 month free service! Will you come talk to my school or business about composting? Absolutely. We have shared our story with dozens of classrooms from Kindergarten to College, businesses, networking groups, industry conferences, and media outlets. Contact us about your upcoming event or classroom curriculum, and we'll connect you with the right person! For schools and businesses specifically looking for training to introduce their new compost system, we can provide any length of presentation for any sized crowd. We can also help with signage. Mention your interest to the Garbage to Garden representative who is helping set up your account, and we'll get you the resources and people you need! Will you offer curbside service in my city? Don't see curbside compost service in your city? Request us - then tell your friends, too! Bring it to Your City! Our flagship partner, Benson Farm, is a MOFGA and DEP certified composting facility in Gorham, Maine. Benson Farm has been a key partner since the early days of Garbage to Garden in 2012 and continues to be a strong ally in the mission to close the food recycling loop and support local growers in Southern Maine. The Benson family has been farming and stewarding the land in Gorham, ME for nearly 100 years. Eddie and Becki began the composting facility on the farm in the early nineties as a way to diversify the family dairy farm. Today, Benson Farm has grown into one of the largest, and most well managed, composting facilities in the state of Maine. Benson Farm's signature Surf n Turf compost blend is a blend of seafood waste from local businesses on Portland's working waterfront, used animal bedding from local farms, and food scraps from our communities. It can be found at garden centers across Southern Maine and is used by dozens of local farms and growing centers, as well as in the weekly compost bags delivered by your Garbage to Garden field operator. In addition to their Surf n Turf compost, Benson Farm also offers a Super Soil blend of loam and their Surf n Turf compost blended, screened, and ready for use in your next gardening project. For more information about Benson Farm Earth Products, please visit bensonfarm.com. Rocky Hill Farm is our partner farm in Massachusetts. Rocky Hill Farm has been in North Saugus since the early 1920s. Now, the farm is one of the state's leading compost facilities and is committed to making high quality compost from local food scraps and other compostable materials. Rocky Hill Farm also offers other landscaping materials including loam, stone products, and mulch. For more information about Rocky Hill Farm Products, please visit rockyhillfarm.net. Still have questions? Feel free to contact us anytime!